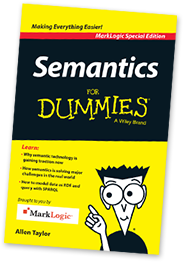 Semantics 101 – Learn the basics of semantics and discover the key reasons why semantics exists in the first place, and why semantics is coming to the fore now in today’s complex, data-driven world. Semantics in Action – Find out how the flexibility of semantics is allowing organizations of all types solve data challenges that were otherwise impossible. Data Modeling – Explore how modeling semantic data differs from relational data, the use of ontologies and the SPARQL query language. The payoff is when you can infer additional information that is implicit in the data. Comparing Technologies – Whereas once relational database technology was just about the only game in town — the situation has changed radically. With more options it’s now possible to handle more kinds of data and to do more with the data you have. This chapter talks about the various data storage technologies from triple stores to graph databases, to combination NoSQL databases — and how they stack up. Ten Things to Watch Out for with Semantics – This chapter summarizes, in ten (okay, nine) easy to digest nuggets of wisdom: the most important things to know about semantics, including when you should consider them, security, and achieving high performance.